1. First Aid Beauty Ultra Repair Wash - Anything in the Ultra Repair line from First Aid Beauty is bound to be heaven on the skin. The cult classic Ultra Repair Cream is by far one of the richest and most healing creams I own. And this body wash takes the best aspects of that cream and brings it to the shower. It's quite thick, and doesn't lather too much, but it does give a creamy, moisturizing, almost balm-like experience when washing. Those with overly dry, sensitive or irritated skin will probably be buying this in bulk - it's that good. 2. Yes to Coconuts Ultra Light Spray Body Lotion - All those too lazy to rub their lotion in, raise your hand. *raises hand* I was ecstatic when I heard this was a spray, and knew I would get more use out of it immediately. Ridiculously easy (and awesome) application aside, the formula is what really matters. Easy and fun means nothing if what's inside is awful. 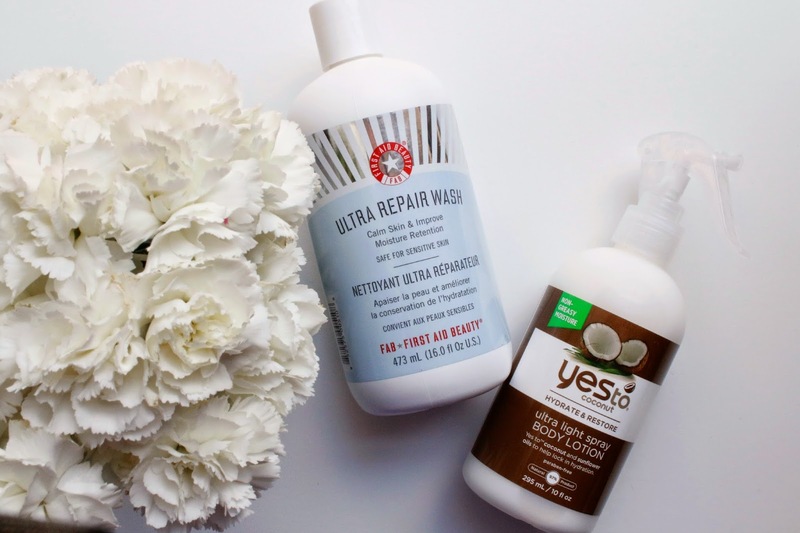 Luckily, this does not fall into the category and the Yes To Coconuts Body Lotion quickly became one of my most used body lotions this summer. Lightweight, easily absorbed and with a scent like coconut, what's not to love? I put mine in the refrigerator for 15 minutes before I apply and it becomes both a lotion and hydrating mist at the same time. What body products are you currently using this summer? Tell me in the comments below.